And of course, a white card is needed. so... costumes! With magic! Aww, thanks @Ranshi922! 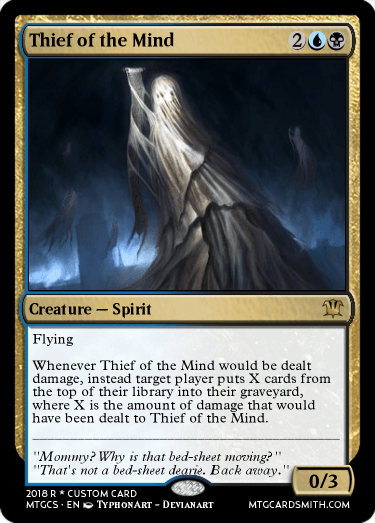 I do my best, even if white is the opposite of most of my favorite cards. I just hope Sorinjace likes it, heh. Aww. Danke Schoen @Ranshi922. That really helps. I don't usually have excess money for premium and mats and all so, I'm hoping my big guns are big enough, yah know? @Shadow29870 Holy Hoax is a cool Angel! Aww, thanks @Sorinjace! I'ma put together all I've submitted soon enough in one post here and just add to it. Ima organize it for yah so it's easier to look through. cool ok thanks! 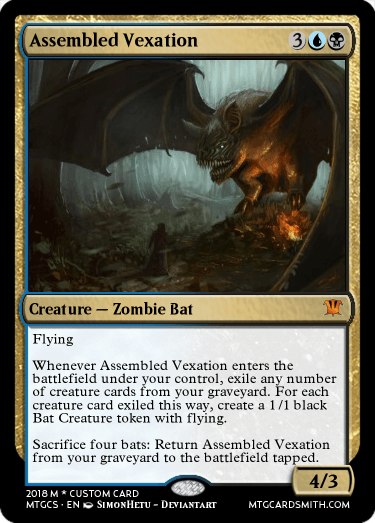 I just dropped a legendary land card called Guilds of Ravnica that rewards the player for playing Gate lands, let me know what you think! I feel it is pretty awesome. 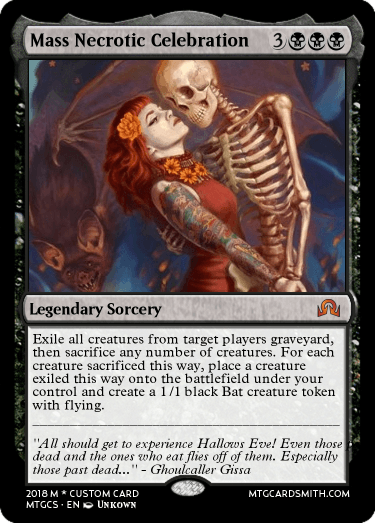 I want to make some planeswalkers but the library computers wont let me use that feature :( Oh well, Ill make other types of cards. 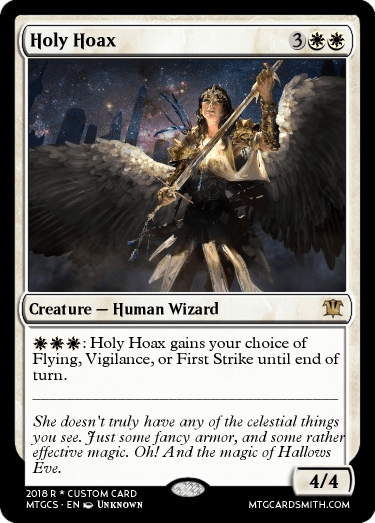 To preface, I personally enjoy Innistrad the most, and I love to imagine that there is a plane that’s essentially ours, but you know, MTG exist in real life. Anywho! Onto the story! 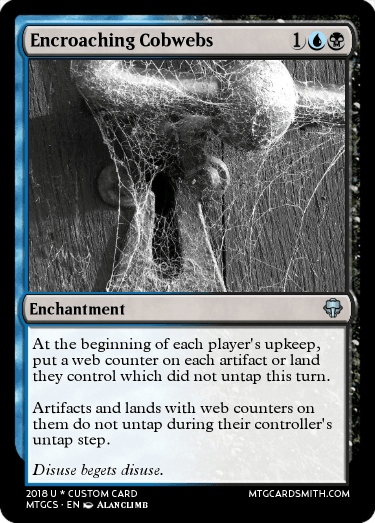 During one of the many, many, many attacks on Geralf’s castle, Gissa discovered a book in the lower reaches of his castle left by a planeswalker from years past, old and dusty, covered in cobwebs. Opening the book she discovers it’s from a traveler from Plane Zero (the plane we live on) and keeps it for herself, after her attack opting to go off and read it by herself. Hours pass before she eventually finds out about holidays, including one known as ‘Hallows Eve’, one she immediately fell in love with. 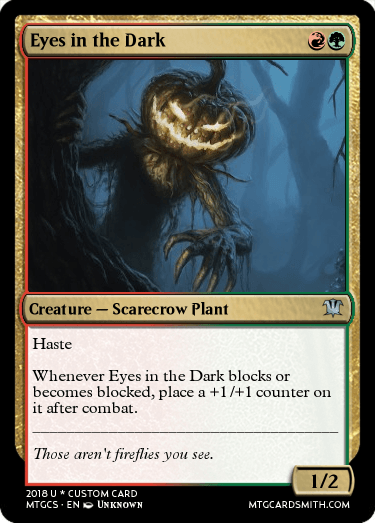 Using magic of her own and magic from the book, as well as some she discovers herself in later explorations, she creates some small areas on Innistrad based around such day that awaken on Halloween all for her amusement. 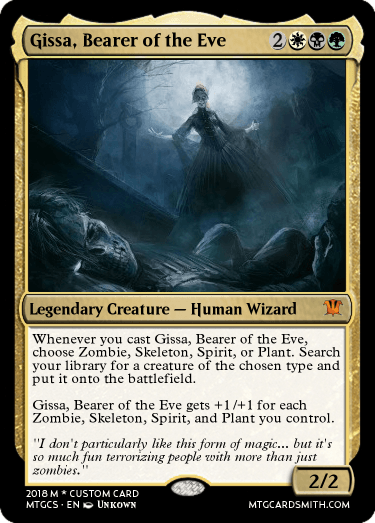 Though a Necromancer, with help from the book and various druids she threatened, Gissa managed to teach herself just enough magic revolving around nature to do a few task she set for herself. 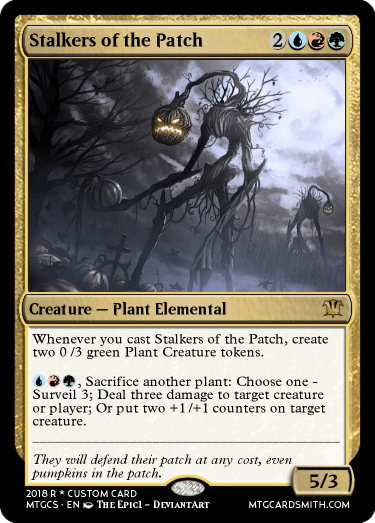 With this in hand and some pumpkin seeds, she created a patch in the Ulvenwald sectioned off known as ‘The Pumpkin Patch’, where the Ulvenwald and the elements use scarecrows, pumpkins, crows and such to defend the patch from any and all intruders. This isn’t limited though, as the beings of the patch will damage it for the sake of its survival. By far one of her favorite zones, the ‘Land of the Recycled’ is simply an area in the Ulvenwald of massive heaps of necromantic energy, where any and all dead who enter it or die there constantly rise, fight, die, and repeat. There is no rime and reason here, and for Necromancers, it’s a virtual playground for experimenting. Her brother Geralf (despite hating her) and other stitchers will use such a place to create subjects they wish to test without risk of being unable to replicate them, setting them free here before deeming them fit for public use, adding much variety to the Land of the Recycled. Much easier to make as it was half necromantic based, half based on her previously gained nature magic, the ‘Season of the Lost’ is an area along the shore of Nephalia cast in permanent chilling cold, darkness, and a sense of dread. 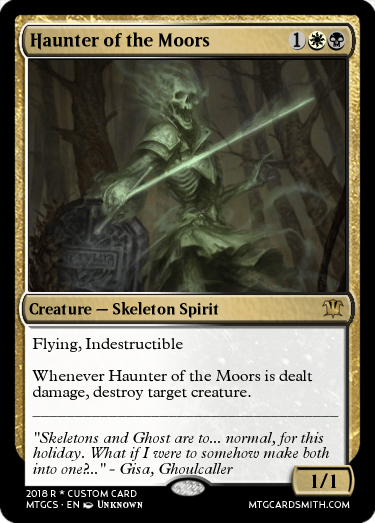 Here spirits lash out at all who enter, or rest, knowing they will be left alone. Some even live here, deciding this is where they belong, a place of simultaneously constant dread, yet perpetual peace. 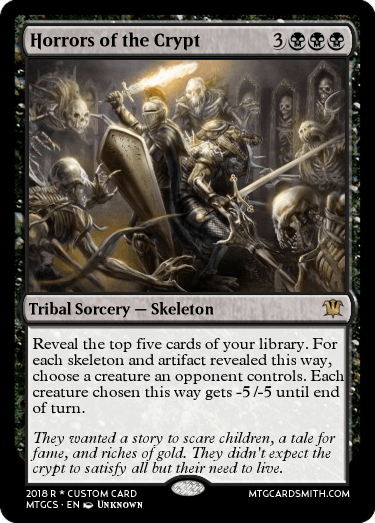 Seeing all Gissa had done, most of the people of Innistrad, the saner ones, immediately despised such and tried to put an end to it. Seeing this, Gissa magically copied that portion of the book, all of Halloween, and spread it the best she could. 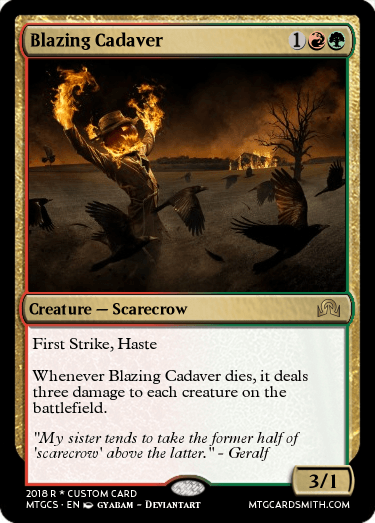 Now, on Hallows Eve, even the denizens of Innistrad loathe or celebrate the holiday, in their own, strange ways. Haven't seen a demon yet, (of course, I might have just missed it if there is one), but here's my first entry. 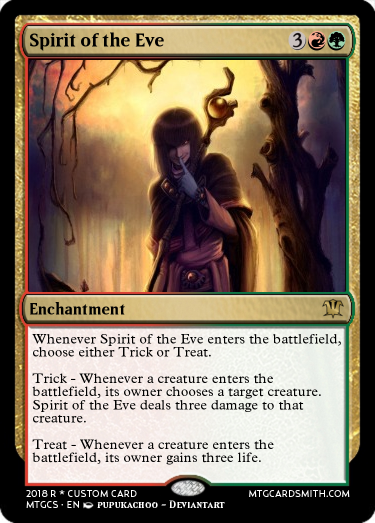 Yet another card I would have expected to have seen already. The pumpkin containers on Hungry Ghosts, that's clever as hell @ChainsawXIV! Nice to see you here as well btw! It's like McDonald's up in here, ba-da-da-da, I'm lovin' it! I think it's clever @Shadow29870! !